This morning something kinda small but absolutely extraordinary happened. We took our first step towards landing a human being on Mars. A Delta IV Heavy rocket system carrying the brand-new Orion Spacecraft launched on at 07:05 (Florida Time). This was the very successful first step in a multi-stage plan (see the image at the top of this post) that ends with human beings setting foot on Mars sometime in the 2030s. Right about the time my daughter will be old enough to buy Alcohol. Perfect timing! Phil Plait has a good run-down of this launch at his blog, Bad Astronomy. Actually, one of the most exciting parts of this whole plan is the middle step, where we launch a robot rocket into an asteroid and then push it into a stable orbit around the moon. How cool would that be!? Shoving mineral-and-ore-rich asteroids into stable orbits could be the future of heavy metal mining. I must admit I got a wee bit emotional watching that launch video. By the time I was born we had long since stopped going to the Moon, so I’ve never actually been alive for any human being touching any celestial object. Tons and tons of robots, yes, but no people. So to have people land on an asteroid and then Mars within my lifetime (hopefully). Is a tremendously exciting prospect after more than 40 years of drought. 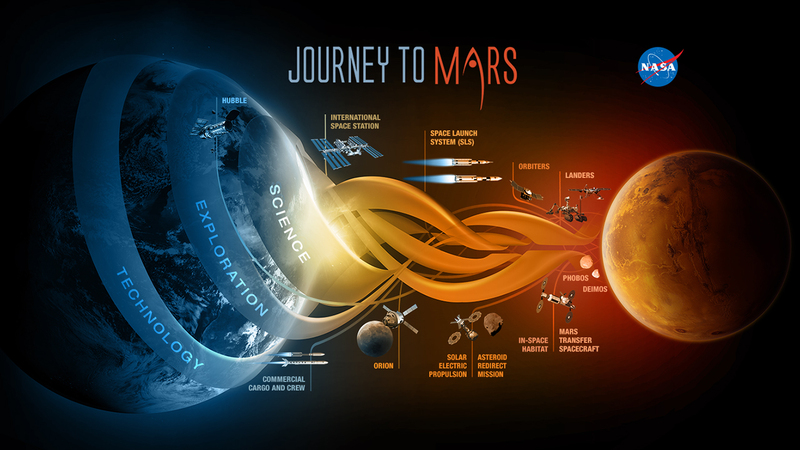 You can read a bit more about the planned “Journey to Mars” at NASA’s website.